If you want to get an idea of what Chongqing used to look like, visit Ciqikou in Shapingba District. 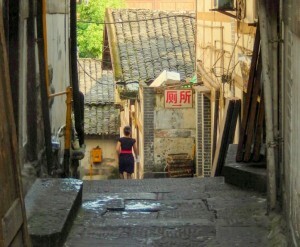 It is both a symbol and a microcosm of old Chongqing. 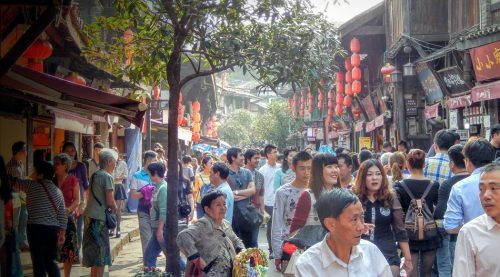 This fascinating old village is perched above the Jialing River which flows downstream to its confluence with the Yangtze at Chaotianmen in downtown Chongqing. It is 1700 years old (click photos to enlarge). 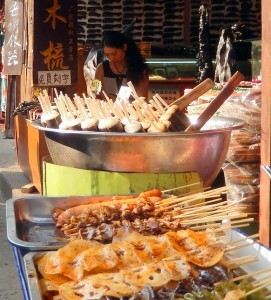 Although it caters to tourists, Ciqikou is an authentic place. 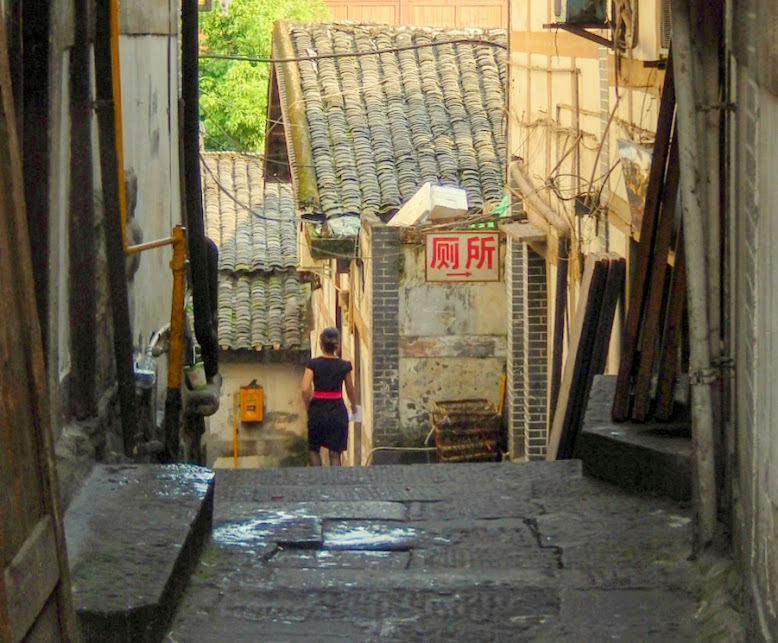 People live here: behind the shops and restaurants lining the crooked alleys meandering up and around the riverine slopes, and above the thronging crowds below. You can see their outdoor sinks, small charcoal cookers, and family washing being aired in the narrow spaces between buildings. 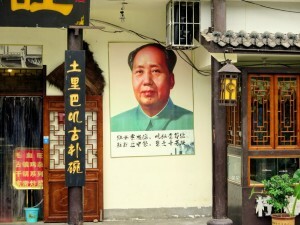 Creative artists have lived here for years: painters, musicians, and experts in calligraphy. You can also find specialists in the street arts of portrait painting, craftsmen making instant exotic creations from warmed liquid toffee, and paper-cutters creating intricate traditional designs in red. Traditional tea houses offer a respite from the crowds, and tiny food stalls provide delicacies that are unavailable elsewhere. Floating restaurants moored to the riverbank specialise in fish caught in the muddy waters that flow past. Drowned in chilis and spices to add flavour, it is best to wash down the meal with the local Shancheng pijou (Mountain City beer). Or if you are game, the more dangerous baijiu – an extremely potent barley based spirit. A restored Buddhist temple perched on the top of a ridge overlooks the township and the river. It’s the last one standing (there used to be five), and looks more like a photo-op than a place of worship. Notice the stern looking matron guarding the entrance from behind her ticket window who makes sure that everyone pays to pray. 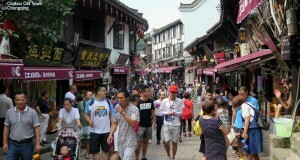 Cai Sheng (The Chinese God of Money) has many devotees here. 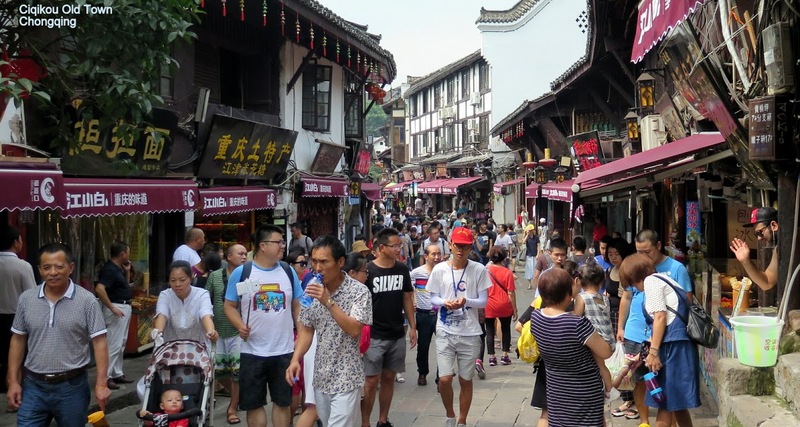 Bus-loads of recent arrivals to the Chinese middle-class wind their way through this interesting little tourist trap. Betraying a hint of nostalgia perhaps, for the old days when their lives were rooted to their extended family, village, and culture.